One of my favorite things about paddle sports is the versatility and multitude of venues or water conditions to paddle in. It keeps it challenging, interesting and fun for all of us. For many the culmination of this is SUP touring. You plan a trip, cover some miles and encounter a wide variety of conditions during your journey. Recently we took some friends who happened to be Professional padders, photographers, etc. on a 3 day journey down the “little Amazon” or Altamaha river in South east Georgia. The end game was simple, right? Cover about 67 miles, be self sufficient (carry all our own gear without resupply) and have a great time. We chose our A’u 12’6 and 14′ boards for the trip. They are large enough to carry the extra weight without compromise. The A’u also has amazing glide and gives you the most for each paddle stroke, something we greatly appreciated after the miles started to add up. 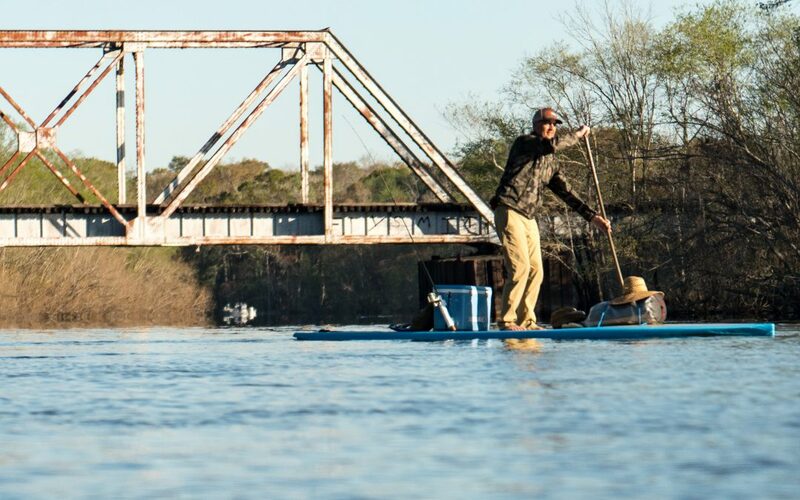 So much so, that we didn’t notice a few more miles that we tacked on the end to get to our intended takeout in Darien, Ga.
Touring on a SUP has it’s challenges. One is securing all your gear and keeping it dry. Dropping something into the dark water tinted by Cypress tree tannins is an exercise in letting go. Never to be seen again. We secured dry box/coolers on each board, just behind our feet, with our bungee/clip tie down system. The perfect place for access and to use as the occasional seat. That’s right, you don’t have to stand up all the time on a SUP. Sitting down and paddling along is quite enjoyable and only requires some minor modifications to your grip and use of the paddle. Rod holders made short work of storing our fishing rods. My favorite piece of kit was a current generation USMC sleep system. It is a bivy sack and sleeping bag stored in a Seal line waterproof bag. Stuff it in, seal it, and squish it to purge air out the one way valve, done. Maps were waterproofed and placed under deck bungee. For launching from steep banks, we would load the boards and slip them into the water or step on board and transfer gear down. After the first day, everyone had it dialed and was comfortable with their own private island. A representation of each person’s personality from pack rat to neat freak. At dusk (or dark) we arrived at our camp sites and each person’s different sleeping arrangements emerged like moths from cocoons. We had a bivy sack, more than one hammock, a small tent, and just a sleeping bag on a SUP for the night. Everyone provided something interesting for dinner from baked beans to a micro brew all the way from the family business in Colorado (Dolores River Brewery). Our friend and Pro Lensman Corey Robinson & his brother are the purveyors. SUP truly is for everyone. Our friends on this trip included my 12 year old son to a professional photographer/videographer. With the proper preparation, anyone could have made this journey. Like most river trips, we had many opportunities to change the length, resupply, or stop early if needed. Change is good, happens often, and is at the heart of any good paddling trip. Over the days, we relished in our upright vantage point. When meeting the occasional fisherman we greeted them eye to eye as they hauled their catch into their small flat bottomed boats. They too would sit at times, but mostly preferred to stand. We found an old railway car, hidden in the brush away from the water’s edge. We were able to spot it from the water and explore the site without leaving our boards. Something we might not have seen from a kayak or canoe. As we slipped across the miles, our day to day lives and stressors faded away. Something that I relish during my opportunities to paddle. It reminds me of something I recently read that said travel destroys ignorance. Enjoying a new place, the people, a different perspective is such a eye opening experience. Spending time on the water with friends is very high up on my list. As the broad Altamaha river, winded through lowland forests, high flood banks and divisions, it began to ebb and flow with the tides as we neared the coast. So too did our emotions, weary from the miles, cooler than expected weather, and comforts of our water world, that brought us real relaxation and joy. This was my second trip on this stretch of the Altamaha and it will not be my last. Where did you start the trip? Jesup, Ga. At Jaycee’s landing.